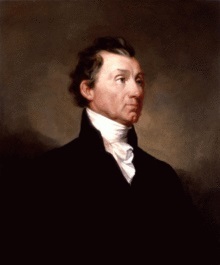 James Monroe was born in 1758 in Virginia to a prosperous family. He attended William and Mary College, but was not there very long when he and some of his fellow students left to join the Continental Army in 1775, serving in the 3rd Virginia Regiment as a Second Lieutenant under Colonel Hugh Mercer. Monroe saw service at Harlem Heights, White Plains, and Trenton, where he was wounded. In the fall of 1777, he was commissioned Major and subsequently named Aide-de-camp to William Alexander, Lord Stirling. He went on to fight at Brandywine and Germantown, wintered at Valley Forge, then fought at Monmouth in June of 1778 before resigning his commission in November of 1778. By 1780, he was studying law under the Governor of Virginia, Thomas Jefferson. His political service began in 1782 when he was elected to the Virginia Assembly and a year later he was a Member of the Congresses of the Confederation until the year 1786. That same year he married Elizabeth Kortwright from New York. As a member of the Virginia convention, he was involved in the ratification of the Federal Constitution, and became a pronounced anti-Federalist. In 1790, he was elected a United States Senator, serving until 1794, when he was appointed ambssador to France by President George Washington, serving in this capacity until 1796. He returned to the United States and was elected Governor of Virginia from 1799-1802. In 1803, he was involved in the negotiations that led to the Louisiana Purchase, and was shortly therafter appointed Ambassador to Great Britian, a position he held from 1803 to 1807. He served a short term as governor of Virginia again in 1811, from January till April, when he was selected as Secretary of State under President James Madison. From 1814-1815, he also served as Secretary of War. He went on to become fifth President of the United States for two terms 1816-1825. His term is probably most well known for the Monroe Doctrine, issued December 2, 1823, which made it official U.S. policy to treat colonization of land in North or South America by European powers as an act of aggression against the U.S.
Support ushistory.org and buy a Monoroe Doctrine poster for your wall!